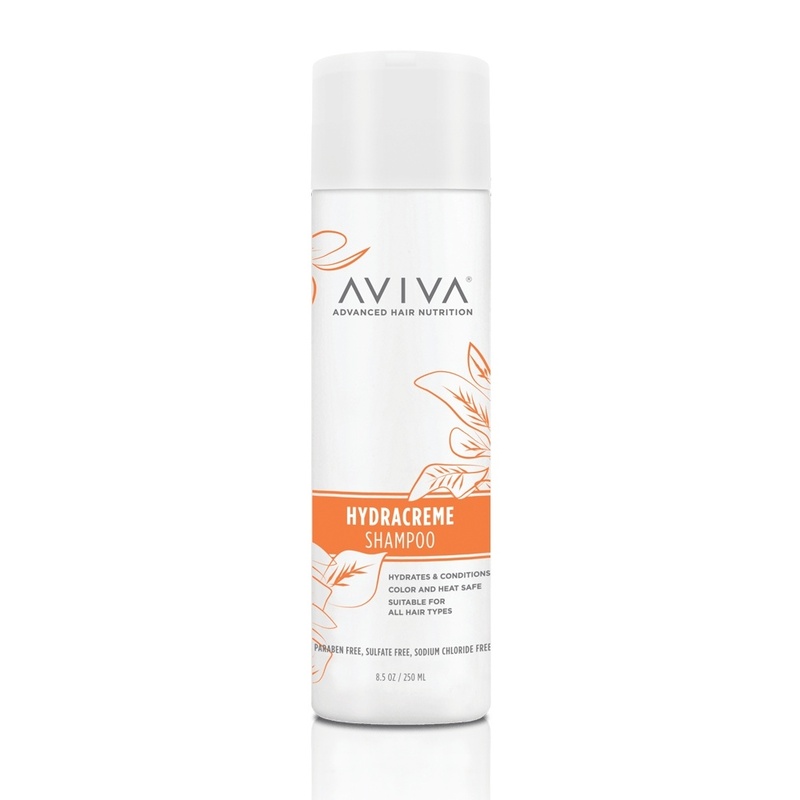 Aviva’s Hydracreme Shampoo is the first step to healthy hair. Suitable for all hair types and safe for both colored and chemically treated hair, this gentle cleanser boosts strength and restores shine. Packed with 11 botanical extracts, our formula eliminates all buildup without stripping your hair of the moisture it needs, leaving your locks nourished and your scalp soothed. Experience the ultimate hair perk with Aviva Hair Care. Aviva’s exclusive Hydracreme and Keratin Renewal products are packed with 11 botanical extracts keeping your hair healthy, shiny and frizz free. Lather into wet hair, starting at the scalp and working through ends. Rinse thoroughly and repeat. Follow with Aviva Hydracreme Conditioner for best results. Water/Aqua, Sodium Cocoyl Isethionate, Cocamidopropyl Betaine, TEA-Cocoyl Glutamate, Stearic Acid, Acrylates Copolymer, Chamomilla Recutita (Matricaria) Flower Extract, Achillea Millefolium Extract, Rosa Canina Fruit Extract, Melissa Officinalis Leaf Extract, Cymbopogon Schoenanthus (Lemongrass) Extract, Quercus Alba Bark Extract, Geranium Maculatum Extract, Symphytum Officinale Extract, Salvia Officinalis (Sage) Leaf Extract, Aloe Barbadensis Leaf Juice, Hamamellis Virginiana (Witch Hazel) Extract, Fragrance/Parfum, Glycol Distearate, Guar Hydroxypropyltrimonium Chloride, PEG-45M, Glycerin, Methylisothiazolinone, Citric Acid, Triethanolamine, Benzyl Benzoate, Geraniol, Limonene, Linalool, Hexyl Cinnamal. 30 Day Money Back GuaranteeWe’re confident that our supplements, will allow you to have the beautiful hair you desire. If you’re not satisfied with your Aviva purchase, simply return it within 30 days for a full refund of the purchase price, less shipping and handling. Aviva works with your natural hair growth cycle to help your hair to grow longer and stronger. Happy hair is healthy hair. Aviva keeps your scalp rich with the vitamins it needs to keep hair healthy and encourage new growth. Our studies show that hair loss will dramatically slow when Aviva supplements are part of your daily routine. The nutrients provided by Aviva fortify hair against product buildup, sweat, and damaging environmental elements such as sun exposure. Aviva will help to strengthen the new hair growth so that it breaks or sheds at a decreased rate. After a significant weight loss my hair felt limp and frail. It started shedding quickly and lost it's luster. I guess I was not eating right. I started to take supplements for my hair a while ago. I think I am not the only one who secretly wished to wake up and have the most beautiful hair, long and thick. But let's be honest, it's not really realistic. After a few disappointments I heard about Aviva. I was surprised at how easy these pills were to take. I normally hate taking even my vitamin but these don't have a smell and are smooth. I am taking Aviva for 6 months now. I am checking the amount of hair-fall daily and it feels less than normal so fingers crossed that it's not just what my mind wants to see. Also I feel my hair is growing faster, I have more hair growing not only in front, but all over my head. It feels thicker and is super shiny. I feel amazing when I run my fingers through my hair. Loving the freebie products as well! I have been using hair vitamins/supplements for years now and have tried so many. Over the past years my hair has become brittle, dry and not growing. I have used this product for 10 weeks now and my hair is slowly growing but most of all- the oils are coming back and my hair looks and feels so much healthier which I have never gotten with any other hair supplement- all I got was stronger nails. Before I started to take AVIVA I had very fine "fly away" hair. As an actress I take extra special care about my look, and needed to take action. My use of AVIVA has given my hair more body. My hair is so much more manageable. Even my hair stylist is astonished about my new hair structure. Finally a product for hair loss that really works! Within 2 weeks of using this product I could wash my hair and not find an abundance of hair in the drain. Same thing with brushing it. Very few strands of hair in the brush. And an added bonus, regrowth around the hairline. I've tried so many products for hair fallout that disappointed me. This one really works. Also very easy to swallow and no side effects of taking on an empty stomach. I can't live without AVIVA! I was so upset when I noticed that I am loosing handful of hair! It started somewhere in my sixties. I was increasingly insecure, worrying if I'll loose it all. No vitamin or hair supplement really stopped my hair loss until I found out about Aviva. I am taking Aviva for about 3 months now and I am absolutely amazed! I believe hair growth for every woman is now possible! It makes me feel great!